It's fair to ask what new things Eli Roth and Bruce Willis bring to Death Wish that the original, made in 1974 with Charles Bronson, didn't have. The answer is: not many. Rather than using this as an opportunity to provide a deeper dive into the hot-topic debate of vigilantism (which is getting a lot of media attention in the wake of the latest high school shooting and suggestions of allowing teachers with concealed carry permits to come armed to their classrooms), Roth elects to "color within the lines" and stay true to the original's template. Also given short-shrift is the question of whether a vigilante might be motivated to stay active by the fame resulting from extreme social media exposure - a topic raised but not effectively explored by this new iteration. The filmmakers seem ultimately unwilling to risk transporting Death Wish beyond what it was in its first incarnation: a grim, violent exploitation film that pays lip service to being more interesting. The movie stacks the deck early by presenting Dr. Paul Kersey (Willis) as an ideal guy. A hard-working surgeon who doesn't differentiate between cop and robber when they're on his table, he has a loving wife, Lucy (Elisabeth Shue), and a college-bound daughter, Jordan (Camila Morrone). His life comes crashing down one evening while he's working a shift for a sick colleague. A trio of criminals breaks into his house, kills Lucy, and brutalizes Jordan to the point where she end up in a coma. In the wake of the home invasion/murder, Paul feels lost and is frustrated by the police's seeming lack of progress. He reaches the breaking point when he is beaten up while attempting to prevent an assault on the streets of Chicago. When a gun comes into his possession, he cleans it up and learns how to use it. Although his eventual goal is to find and kill the men who destroyed his family, he's not beyond dispensing justice in other circumstances, such as saving a carjacked woman or killing a drug dealer. Thus is born "The Grim Reaper" - a social media sensation who becomes the talk of morning radio call-in shows and whose existence is met with ambivalence by Police Detectives Raines (Dean Norris) and Jackson (Kimberly Elise). Bruce Willis approaches the role with less swagger than he normally uses, although his past baggage makes it difficult to accept him as an "everyday" person pushed beyond the ordinary boundaries of human tolerance. Elisabeth Shue is surprisingly unconvincing in limited exposure - the scenes in which she is begging for mercy are cringeworthy. Some gallows humor is provided by the detective pair of Dean Norris and Kimberly Elise - I could envision a spin-off featuring these two. Vincent D'Onofrio is on board in the thankless role of Paul's ne'er-do-well brother (someone who serves no purpose whatsoever and could easily have been elided from the script). Joe Carnahan's screenplay is based on the Brian Garfield novel and the 1974 script credited to Wendell Mayes, although, when the two diverge, it hews closer to the latter. Garfield, who was displeased with the Bronson movie, claimed that the anti-vigilantism message of his book was turned 180-degrees in the movie. Roth does nothing to reverse things: the new movie's sympathies present the killings as cathartic, "rah rah" moments and develop Paul as a tragic-but-heroic figure. This Death Wish frequently references the original. There's a location flip - in 1974, the action began in New York City and ended in Chicago. Here, it's the reverse. And the "finger-gun" gesture used by Bronson is invoked by Willis in the film's most direct homage. 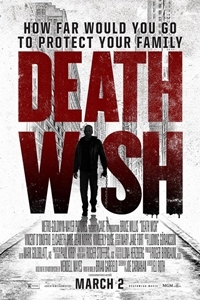 The 2018 Death Wish has been developed with a specific audience in mind - those who enjoy these kinds of thoughtlessly violent outings. The direction is workmanlike, although without the flourishes that have added some visual razzle-dazzle to similar orgies of brutality like John Wick and its sequel. By neutering Willis' penchant for self-deprecating humor and turning him into a virtual automaton, Roth further limits his film's enjoyability. Death Wish is in many ways a throwback, which would be okay if there wasn't already an okay version of the same story kicking around from the 1970s (with four increasingly bad sequels for those who want to see more).